Over 300 years ago, the Dutch settlers arrived to establish the first town in Delaware, now the town of Lewes, DE. 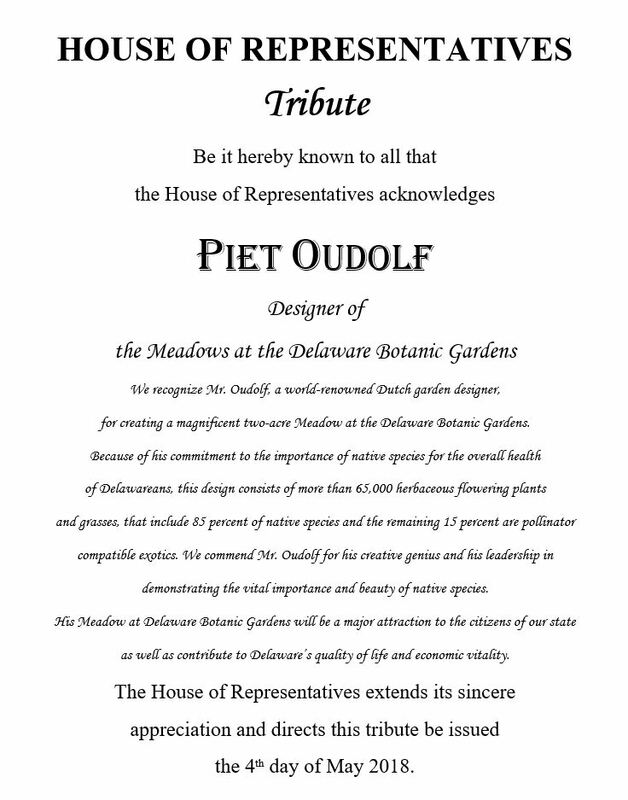 On May 3-4, there was another Dutch landing when the internationally renowned Dutch Garden Designer, Piet Oudolf landed near Dagsboro, DE, at the new Delaware Botanic Gardens (DBG). Piet was in Delaware to supervise the gardens’ 100 volunteers planting nearly 18,000 new native perennials in the 2-acre Meadow Garden. This planting took two days, and added to the 17,000 native perennials planted last September. To mark this occasion a Sip & Saunter celebration for garden supporters and volunteers was held on Friday May 4. The Sip & Saunter celebration was the first public onsite event, and was made more festive by the support of Dogfish Head Brewery. Attending the celebration were state and local government officials, including U.S. Senator Tom Carper and State Representative Ron Gray. DBG President Ray Sander said, “The 2-acre Meadow Garden, designed by Piet Oudolf, is the jewel in the crown of DBG. When completely planted in June 2018, this Garden will have 70,000 perennials and grasses. We are thankful that Piet took the time to be with our garden friends, sponsors and volunteers, who are making the garden, come to life. While we are still building, our gardens will begin to be open to the public sometime in 2019. The mission of the Gardens is to create an inspirational, educational, and sustainable public garden in Delaware for the benefit and enjoyment of all. The Delaware Botanic Gardens will celebrate the coastal plain with a sustainable garden that delights and educates visitors and inspires them to preserve Delmarva’s native landscape.